Have you ever seen a ski race on the mountain and wondered what it would be like to participate? For over 30 years, PACRAT Racing has provided an easy way for skiers and snowboarders on Mt. Hood to find out for themselves. People race PACRAT (Pacific Northwest Area Clubs Recreational Alpine Teams) for many reasons: the thrill of competing, a love of racing, and sometimes just the opportunity to meet new mountain friends. PACRAT races are fun, safe, and offer a challenge to all skill levels. After trying racing for the first time, many racers tell us that they wish they had discovered it sooner. PACRAT racing is a team-oriented league, with racers on each ten-member team trying to accumulate the most points over our five-race series. We have team awards at the end of the year with some additional recognition for individual racers. Because our point system rewards individual improvement, first-time racers are often high scorers, which makes them popular among their teammates. Post-race parties (included with your racing dues) are the perfect time to brag about a fast run, lament an off day, socialize with friends, enjoy food and a beverage, and a chance to win door prizes. Our top-shelf Phoenix-Microgate timing system is one of the best on the mountain, allowing our races to start on time and stay on schedule. Our course crew works hard to keep the course safe so everyone can concentrate on having a fun time and bringing their A-game. Our racers are also eligible for discounted lift tickets on the day of each race. PACRAT races are held at Mt. Hood Skibowl, Mt. Hood Meadows, and Timberline. For a current race schedule, check out pacrats.org. The season’s grand finale is the Rat Attack, PACRAT’s end-of-season award banquet. This event (also included with your racing dues) is when team results are announced and trophies are awarded. The male and female racers who have shown the most consistent improvement during the season are crowned as King and Queen Rat. In addition to food, drinks, and awards, there are door-prize giveaways and entertainment. PACRAT’s NASTAR affiliation is another perk that our racers enjoy. NASTAR is a national recreational ski racing group featuring national handicaps. All of our series races count towards NASTAR points, and we host two NASTAR open races, weather permitting, that are open to the public. NASTAR national competition provides many with an opportunity to medal, based upon age, gender, and ability. Plus, your PACRAT race results may allow you to qualify for the NASTAR National Finals. The 2019 championships will be held April 3-7, 2019, at Squaw Valley-Alpine Meadows. For more information or race results go to nastar.com. An elected volunteer board oversees the season of racing, parties, awards, finances, and administrative matters. 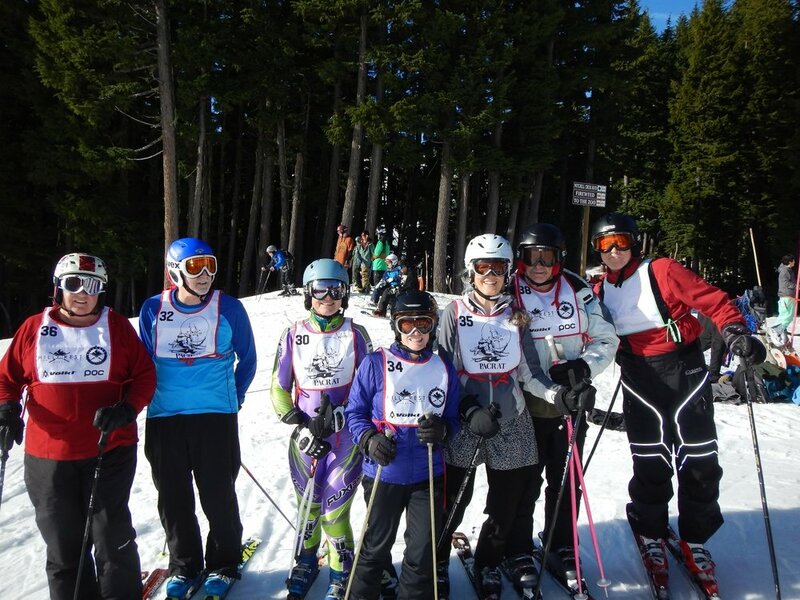 The only requirement for participation is to be a member of a NWSCC club (which gives you even more chances of meeting some new ski buddies or socializing with friends).For more information about joining us for the upcoming season, including joining an NWSCC club, check out our website or e-mail membership@pacrats.org.